A "San Jacobo" is a popular "merienda" (afternoon snack) or tapa in Spain. 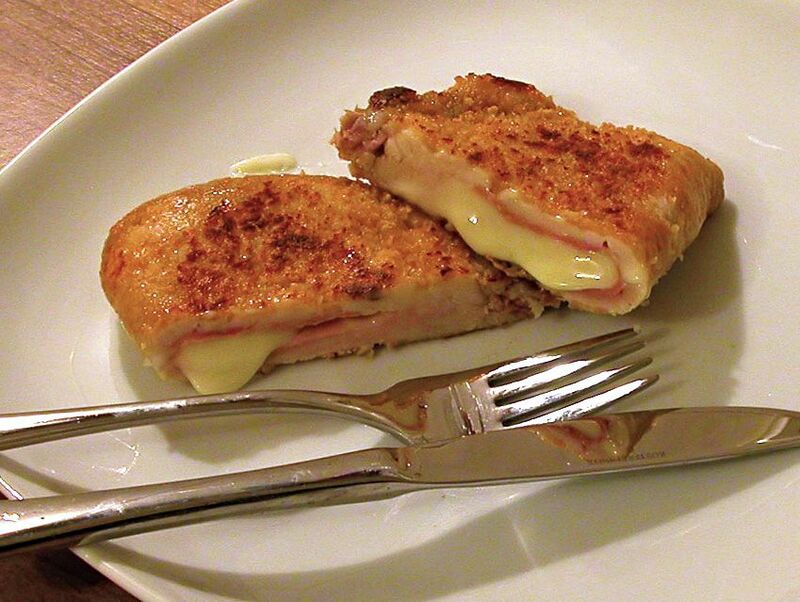 It consists of a slice of cheese between 2 slices of cooked ham, which is breaded and then fried. It is delicious when the outside is crispy, while the cheese inside melts between the slices of ham. Could the "San Jacobo" be Spanish fast food? It's delicious, easy to prepare and economical. Lay 4 slices of ham on clean work area or counter. Lay a cheese slice on each ham slice and another slice of ham on top. Break the eggs into a medium-size bowl or a small, open baking dish with a flat bottom. Add water to eggs and beat with a wire whip. Put flour and breadcrumbs onto a dinner plate and mix together. Pour enough oil into a medium frying pan to completely cover the bottom. Heat on medium. Fry the San Jacobo in the oil until golden brown and turn over and fry on the flip side. Remove from the frying pan and place on a paper towel to drain. Repeat the breading and frying with each of the other 3 San Jacobos. Serve hot accompanied by bread.